It’s a rough day. A tsunami in Indonesia has killed many people, and the pain is so fresh that there’s not even a death count yet. A couple of my good friends are going through various personal crises that will affect them for the rest of their lives. And if you’re in the US, then one way or another you’re probably upset about what’s going on with the Supreme Court nomination. I should be working on any number of other things. There are projects to complete, and new projects that need to get sorted out before they begin. 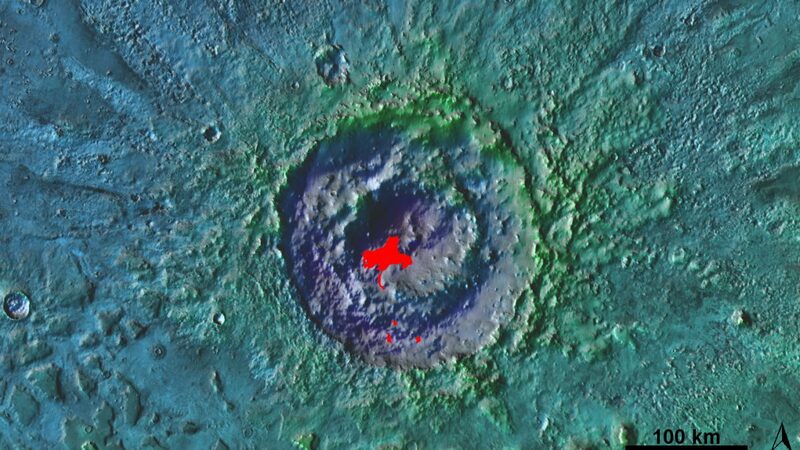 But for the moment I need to clear my head, and I’m going to do that by talking about Lyot crater. Lyot crater, on Mars (click to see full image). 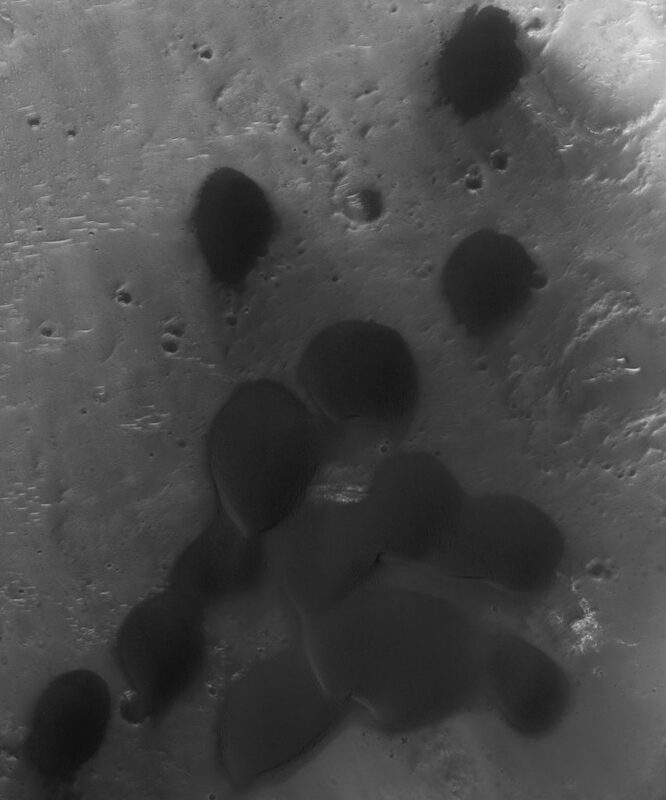 On the left is MOLA color topography draped over a THEMIS IR mosaic (locations of dune fields are colored red); on the right is a MOC wide angle mosaic. Lyot crater is 220 km (137 mi) across, the 36th largest crater on Mars. It formed in the Early Amazonian epoch, about 3.3 billion years ago. 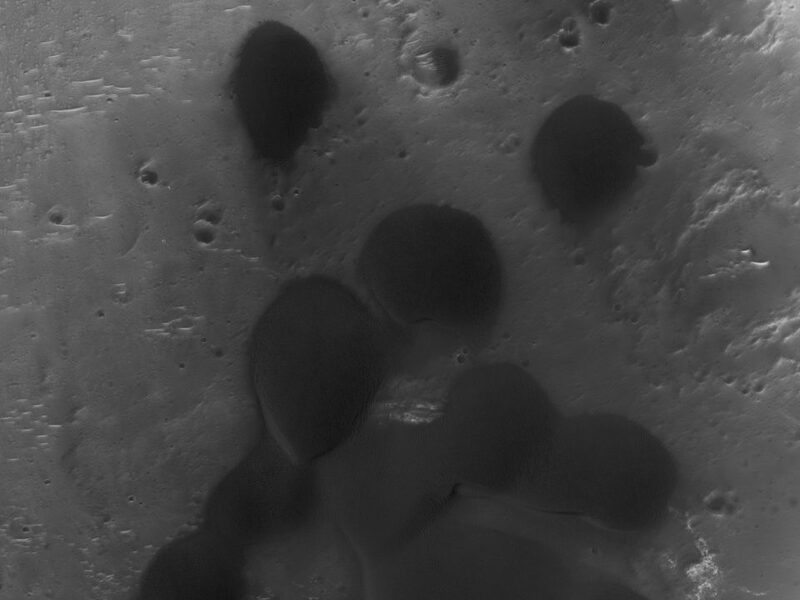 Lyot is one of the few large craters located in the northern midlatitudes, which are otherwise covered by a flat-lying expanse commonly referred to as Vastitas Borealis (the “Northern Wastelands”). It’s thought that many billions of years ago (long before Lyot crater formed), this may have been the site of an ocean. Craters larger than ~100 km across tend to form peak rings inside, which is why you see two circles when you look at Lyot crater. It’s an easy way to tell whether your scalebar is right or not – simple bowl craters (like the little one at the left edge of the figure) are much smaller. Much of the above information comes from a recent USGS Geologic Map of Mars (Tanaka et al., 2014), which you can also download for free. The colors on the left indicate elevation: note that they range from purple to blue. 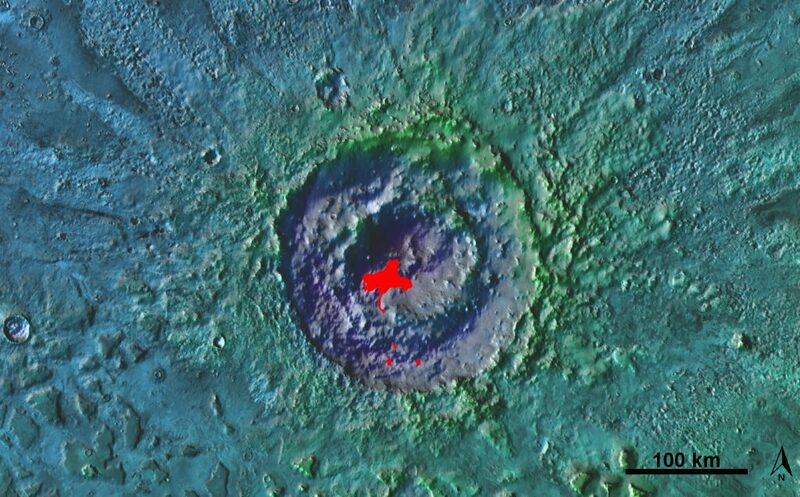 What’s remarkable about Lyot crater is that the center of the crater is so low, (and also located in ice-rich northern plains) that it’s thought that liquid water could be stable on the crater floor during periods of high axial obliquity (which have occurred in the past million years, which is very recent for that sort of activity on Mars). The walls of the crater are covered in the remains of fluvial systems that are thought to have formed as glaciers melted. The valleys date to the middle to late Amazonian (within the last billion years or so). 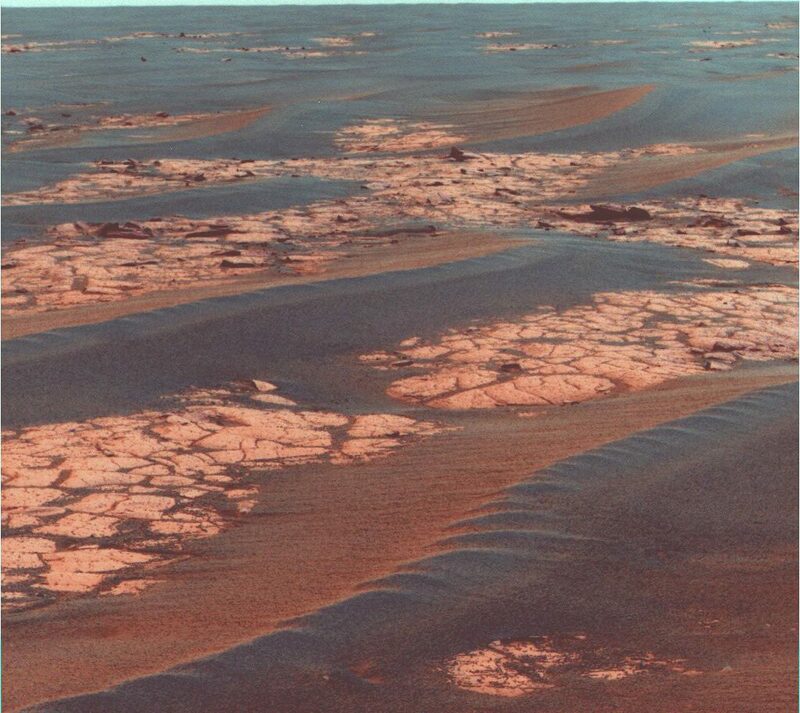 They’re the youngest set of big valleys known on Mars, unless my information is out of date. This information comes from Dickson et al. (2009). But of course I’m a dune person, not a crater person or a fluvial system person. Yeah, they’re all inter-related. But it’s the dunes I’m turning to for comfort today, to remind myself of one of the reasons I get up in the morning. So on the left in the above image are some red spots that correspond with where dune fields are located in Lyot crater. Note in the right that the dunes are dark relative to the surrounding terrain. Dunes on Mars are dark: the sand is kept free of bright dust, so you’re seeing the dark volcanic materials that the sand was originally derived from. Dune fields in Lyot crater (click to see full image). CTX images. Even when zooming in this far, the dunes are a little hard to see. So let’s see if I can do a little better than this. One thing to note is that our dune field outlines probably don’t capture all of the dunes. We’re working to map out all of the dune fields on Mars, but that’s a big job! Lyot crater’s main dune field (click to see full image). CTX images. Note how the winds on the left side push sand toward the center of the dune field, as do winds from the right and the top. See those big dunes on the left (west) side? They’re amazingly beautiful. Strong westerly winds are common in Mars’ midlatitudes, just as they are here on Earth (driving most midlatitude storms from west to east). 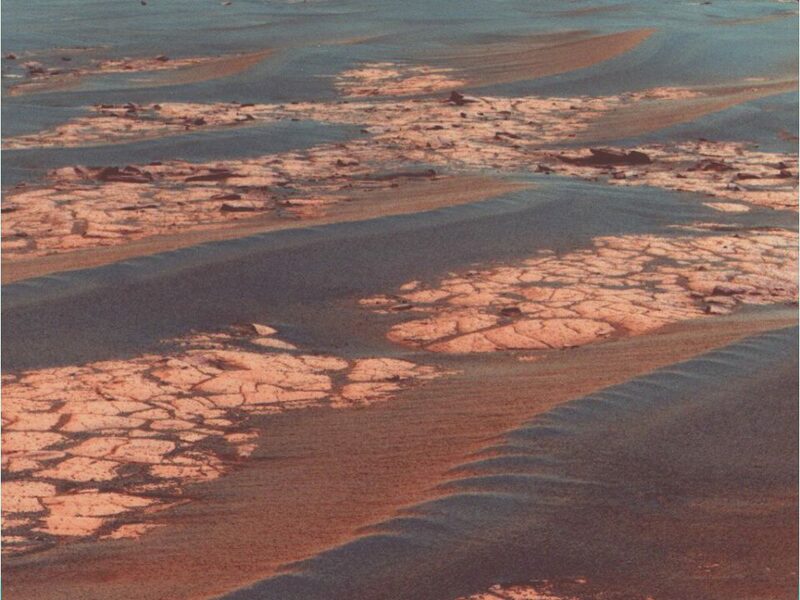 The same sort of pattern can be seen in Mars’ southern midlatitude dunes, which are much more plentiful than northern midlatitude dune fields. This rarity makes Lyot crater dunes special. Looking to the northern and eastern edges of the dune field, you can see that winds are also pushing sand from those directions, toward the center of the dune field. This is why the dune field is where it is: because the winds push it there, and it gets trapped. This sort of dune field is found in basin-and-range topography on Earth, such as the Kelso Dunes in the Mojave Desert or, on a much larger scale, the Taklamakan Desert in China (although the dunes there are mostly formed by westerly winds). OK, I’m starting to feel better now. Lyot crater’s southern dune field (click to see full image). CTX images. Here the westerly wind dominates. Oh wow, look at that. Here, that westerly wind pushes sand toward the east, forming a ~60 km (37 mi) long transport pathway. Beautiful. Why do the two dune fields have different wind patterns? I’m betting it’s the topography. Out on the plains, the westerly wind will be what moves the most sand throughout the martian year. There are probably seasonal differences (just as there are windier seasons in most places on Earth), and the winds probably vary from day to night, and as dust storms blow through. But the westerly winds prevail, blowing sand from the plains into Lyot crater (or perhaps simply eroding it from those fluvial and glacial deposits already inside the crater – we don’t know where the sand comes from!). So the westerly wind is what we see reflected in the southern dune field. But the larger main dune field is deep in the center of Lyot crater, 400-900 m (1/4 to 1/2 a mile) deeper than the southern dunes. 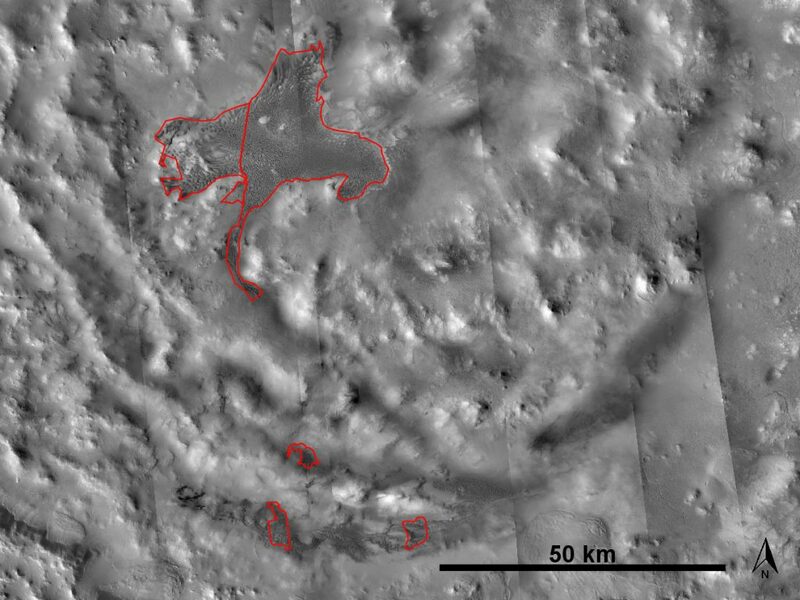 High relief topography has a big effect on winds, even more so on Mars than on Earth. Under the right conditions, winds can be accelerated up or down a slope. It depends mainly on the temperature structure of the air – this will be familiar to those living in places where strong wind storms can blow into their city from nearby high terrain, like the Santa Ana winds. Something about the steep peak ring walls must accelerate winds into the center of Lyot crater. I’d bet that westerly winds are responsible for bringing most of the sand into the crater to begin with. But that big main dune field piled up because once the westerly winds ran into places where northerly and easterly winds are strengthened by steep topography, they keep the sand from moving any farther. Sand just kept coming in until a big dune filed piled up. I hope that makes you smile. I feel much better now. And now off I go to read papers on dust devils in China. Maybe things aren’t so bad after all, in this moment. a long time ago i used to travel by taxis on unpaved roads in nigeria. 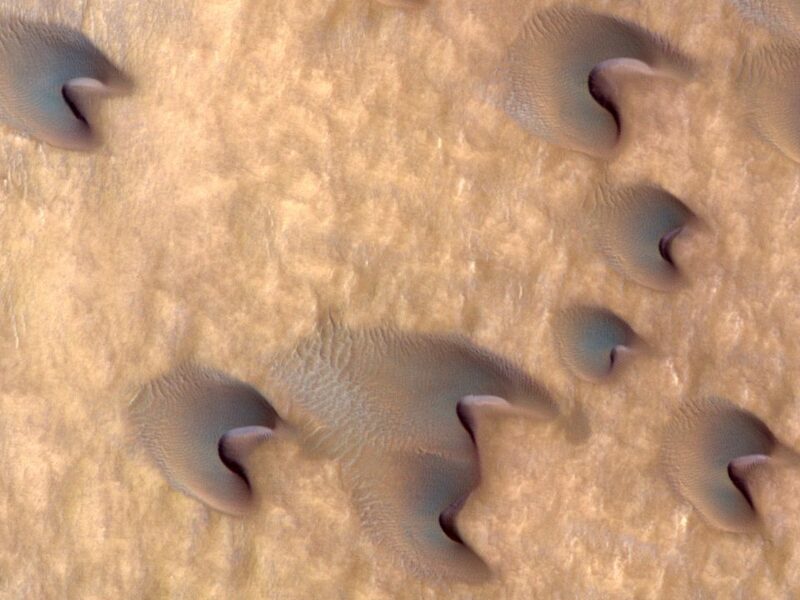 the phenomena i want to understand may be connected to how the dunes form. they level the road (packed soil) after few weeks or so, the ripples form on the road. i think they are periodic and almost as wide as the road. when you travel on them you feel the bounces and beyond a certain the taxi almost glides over. i always wanted to understand model this . simple differential or pde equations describing this would be nice. i don’t what is done about this or similar problems. even pointers to works related to this is helpful. It’s called washboarding. It’s been a problem for transportation since forever, and I think there’s still no fix for it (except to drive fast enough that you don’t feel the bumps). It may or may not be the same process that creates aeolian ripples, but they probably are an anthropogenic type of bedform. i enjoy reading your blog. i can sense your enthusiasm and your knowledge of dunes on mars. i am math teacher so i f you have any suggestions for modeling dunes, i wold like to know. Thanks! 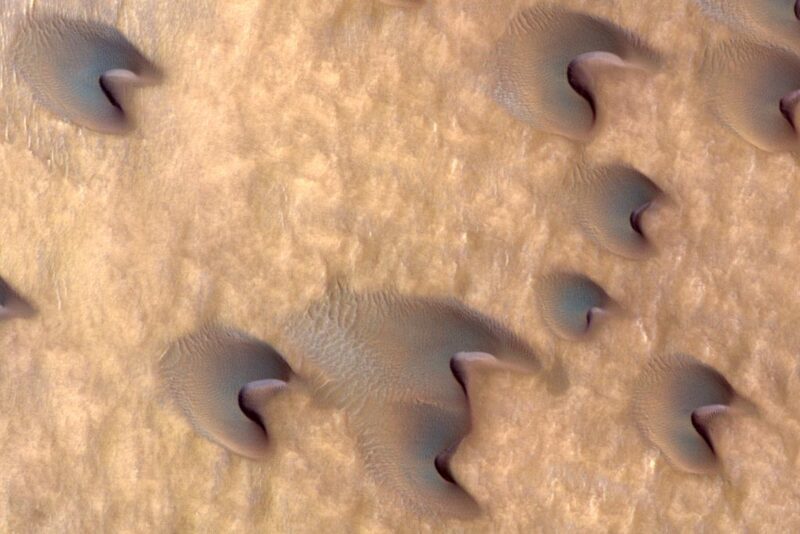 There are many ways to model dunes. What did you have in mind?